Below are questions and discussion topics for Sheila Flaherty’s novel East of Mecca. These questions contain SPOILERS if you have not already finished reading the novel. Where does the title “East of Mecca” originate? Under the same or similar circumstances, would you have made the same choice as Sarah and Max when they moved their family to Saudi Arabia? Why or why not? Did you like Sarah? Why or why not? Which aspects of Sarah do you most and least identify with? How did she change over the course of the story? Did you like Max? Why or why not? How did he change after moving to Saudi? How do you feel the children adapted to living in Saudi? The first day in Saudi, Sarah was fingerprinted, photographed holding Max’s ID number, and her passport was confiscated—only to be released with her husband’s permission. In what ways did Sarah’s experience put her in the position of Saudi women in the Kingdom? How would YOU feel in Sarah’s shoes? What did you think of the Women’s Club? Would you have joined? In Chapter Twenty-Six, Yasmeen tells Sarah, “A veil gives me freedom.” In what ways does Sarah come to personally understand this? What range of emotions did you experience while reading East of Mecca? Which moments and particular scenes do you recall being most affected by? Which were the most compelling, painful, frightening, enlightening, and/or inspiring? In Chapter One, Sarah tells us she blames herself for what happened to Yasmeen. Why? What else do you think Sarah blames herself for? In Chapter Five, Sarah confesses to have kept her smoking a secret from Max. What does, “Maybe I just liked having a secret,” reveal about Sarah’s nature? What else might it suggest? How do themes of secrecy, trust, and betrayal play out through the book? What were signs that Sarah’s marriage to Max was troubled before moving to Saudi? How did life in Saudi exacerbate these problems? Discuss the roles of the other women in the book—Yasmeen, Sarah’s mom, Ruth, Lara, Sissie, Bobbi, Rebecca, Bonita, Amy, Jennifer, Leila, Dr. Kayra? What was the role of mothers throughout? —Sarah’s mom, Sarah, Yasmeen’s mother, Leila, Yasmeen (as mother to be)— How must it be for Arab women when they are totally without resources to protect their young? What roles did men play?—Max, Ray, Yasmeen’s uncle, Jamal, and Mohammed. How do the extreme oppressive restrictions in Saudi also define the choices men must make? How was the abuse and repercussions Kate experienced in Saudi the same or different than had she been in the States? After “witnessing” Kate and Nora together, how did you experience the forced marriage of 13 year old Nora to man in his forties? How does Kate’s fantasy about Nora marrying a “prince” speak to the romanticized notions of marriage our daughters are programmed to believe through movies and other media? Following Yasmeen’s death, Sarah is grateful the call to prayer had not been playing during her stoning because “it would forever help me remember it was not Islam that killed her.” It there a difference between religion and fundamentalism? Explain. After reading East of Mecca, how much more do you know and understand of the plight and emotional/psychological workings of women without choices—in Saudi or in abusive marriages anywhere in the world? What do you now understand about the importance of prohibiting honor killings and child marriages and the restriction of women’s autonomy—wherever practiced? In the Prologue to East of Mecca, Sarah says of the box of mementos from her time spent in Saudi Arabia, eighteen years before, “I was always aware of it, shoved deep into the recesses of the hall closet—lying in wait like a repressed memory.” How was opening the box instrumental in tapping into the unconscious—unlocking emotions and memories—calling forth Yasmeen’s spirit. What sort of mood is established through the language and style of the Prologue? What are we to take from its final sentence? What is the tone of this line in particular? In the Prologue and again in Chapter 24, Sarah hears Yasmeen’s challenge to “Be brave.” How did these two words impact Sarah during her time in Saudi Arabia, and in making the decision, 18 years later, to tell their story? In the United States, Sarah was a social worker. How does Sarah’s introversion and deepening depression contribute to her experience of isolation once in Saudi. Compare and contrast life before, during, and after Saudi. How did Sarah’s recollections of feminist readings help empower her to adjust to her new life in Saudi—despite the stark contrasts between before and after? Do you think Sarah’s experience working in the compound hospital helped her see and understand about the life of women in the compound—both Saudi and American women? Explain. Explain how, what first appeared to be delusional thinking, when Sarah fantasized about “the woman on the beach”—that they could be allies and “She’s going to help me make this work” turned out to be true once Sarah met Yasmeen. What her visit to women’s quarters let her see about the secret life of Saudi women and how they live—ways they have freedom and in ways their freedom is so restricted. How did the Saudi women experience freedom within the women’s quarters? In what ways are their experiences richer than those of typical American women? There are many powerful sensory images in East of Mecca—engaging all five senses. Which of these do you recall most vividly? If you had to distill, in a few sentences or so, the essential themes driving the narrative in East of Mecca, what would they be? What sorts of narrative clues does Sheila Flaherty thread through her narrative—especially in the first few chapters—in order to clarify and add layers to the exact nature (and origin) of Sarah’s personality and character? Discuss, for example, Sarah’s extreme introversion. Which aspects of Sarah Hayes do you most and least identify with? How did you perceive Sarah’s fascination and obsession with the “woman on the beach,” before she was finally able to meet Yasmeen. How did it put Sarah at risk? Thinking that Yasmeen would be the one to help her make it through. After “witnessing” Kate and Nora as two young and innocent children making “mamools” in the kitchen together, how did you experience the forced marriage of 13 year old Nora, to a fortyish year old man? How does Kate’s initial fantasy of Nora marrying a “prince” speak to the romanticized notions of marriage our daughters are still being programmed to believe through movies and other media? Following Yasmeen’s death, Sarah is grateful the call to prayer had not been playing during her stoning. “Yasmeen was a devoted Muslim, and it would forever help me remember it was not Islam that killed her.” Why is this differentiation between religion and fundamentalism so important for Sarah—and for the rest of us. How did your feelings about Sarah evolve over the course of the novel? Describe the Sarah we meet in the Epilogue, and compare her to the Sarah who greeted us early on. What has happened? And how is the change reflected in Flaherty’s narrative tone and rhythm at the close of the novel. To what degree would you say Sarah has healed? Explain. And from what emotional injuries might she still be healing? 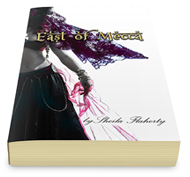 East of Mecca is written as Sarah’s confession…or telling the story that will set her free. Did you ever believe that Sarah was responsible for what happened to Yasmeen? Explain why or why not. Like psychotherapy. In the final line of the Epilogue, Sarah says of Yasmeen, “Even though I’ve told our story, her spirit still haunts me—she is my familiar.” What is meant here? How does it speak to all that has come before it in East of Mecca? As a result of reading East of Mecca, how much more do you know and understand of the plight and emotional/psychological workings of women without choices—in the Middle East or in abusive controlling marriages anywhere in the world? What do you now understand about the importance of condemning honor killings and child marriages and the restriction of women’s autonomy—wherever they are practiced?